There is a new wave of organizing starting to take shape in Canada's social change sector, driven in part by the successes seen in recent progressive U.S. organizations and political campaigns. What exactly is this "organizing" approach and why is it powerful? There is a new wave of organizing starting to take shape in Canada's social change sector, driven in part by the successes seen in recent progressive U.S. organizations and political campaigns. This wave is different in approach used by most Canadian advocacy and political campaigns over the past few decades, an approach that has had diminishing returns for some time now. What exactly is this "organizing" approach and why is it powerful? We can try to answer that question with definitions and theories -- indeed, I've done some of that before -- but we can also get at the answer by starting to tell the stories of Canadian organizers themselves, the stories of the people who are doing this work and who are already having a big impact. Jill O'Reilly, Jolan Bailey and Celine Trojand are three organizers who have generously agreed -- sometimes reluctantly -- to share their stories. In the telling of who they are and what they do, we get a rich picture of what organizing is and what it can do. Their stories are also the story of where social change in Canada is heading, and where it must go if we are to see the change we need. Jill O'Reilly was reluctant to be interviewed for this piece. Part of the code at ACORN Canada where Jill works is for organizers to decline media appearances, since her job is to help others to raise their voice rather than to raise her own. "Organizers should be neither seen nor heard," she says. ACORN Canada is an organization of low and moderate income families that works on social change one neighbourhood at a time, identifying issues that matter to its members such as tenants' rights, payday loan fees, and living wage. The group is now at about 54,000 members, and is growing. It is based on the model of ACORN in the U.S. that organized for decades before being sabotaged by a targeted campaign by conservative groups. Jill works in the Ottawa ACORN office but grew up in Newfoundland and New Brunswick. She was always opinionated as a kid but it wasn't until late into her studies when the Iraq war changed her. "I realized that, wow, the world is messed up," she says. "I realized there was more to things than just studying them and so I started volunteering at the Red Cross to get involved." After school she moved to Toronto and was working at Starbucks by day and in a library at night, scanning books. ACORN posted a job and Jill decided to apply, but when she arrived at the interview there were over 50 people there. "I thought there's no way I was getting this job, but then they started telling us that the position involved door knocking, field work and odd hours and that scared a lot of the others off." Jill went out on a trial run with the Toronto director and watched him knocking on doors. "He was signing up these regular ladies and they were getting fired up and I thought, that's awesome! This is how you change the world. I called the director up the next day and told him I wanted the job, and I guess he realized I was really into it." Starting off, ACORN puts its new organizers through two weeks of training. The group is very methodical about how many hours are put into field work, with the priority on talking face to face with as many people as possible. Jill gets emotional when describing what organizing means to her. "I believe the world should be a better place," she says, "A lot of the people we work with don't get a voice. They don't get better housing. They don't get better wages. People really want to see change, but we're afraid to ask for things. So we start asking. We ask people for things every day." For Jill, organizing is also about logic since it's about numbers, about asking a lot and being persistent. Maybe the first time you ask you get a "no," but you keep asking enough and people begin to come through. There's no doubt that this needs a lot of effort, lots of work at the door and on the phones, but that's what it takes. "People who want change talk a good game, but often we're not doing the hard work," Jill says. I ask her whether some moment sticks out for her, where she saw the power of what she does. Jill remembers a person from South Ottawa, a woman who stepped up to help lead a local battle against a particularly abusive landlord who was leaving people without heat and with mould growing in their basements. After some months of organizing and protesting, the community leader was invited to a meeting with the landlord, the mayor, the local councillor, and even somebody form the Ontario Premier's office. "At the end, the councillor was just yelling at the landlord, saying there'd be hell to pay if things didn't get better." Jill said. "I thought to myself: This is pretty cool, it works." Ultimately for Jill, organizing is about power. "We say there are two types of power -- organized people and organized money. We are organizing people every day so that they can get a piece of the power they are entitled to. It's all about building people's movements. And it's about doing the work." In some ways, Jolan Bailey of Leadnow.ca is an unlikely organizer, growing up in a conservative Christian family in B.C. 's Okanagan Valley. He grew up wanting to be an architect, wanting to design green buildings, but a bus trip changed his mind. "I was coming back home after a university term, and the bus rounded the corner to look over the forest where I grew up playing as a kid. And, instead of a lush green living forest there was now a rust coloured dying forest, because of a pine beetle outbreak caused by climate change. I thought: If climate change is having this kind of impact for a privileged person like me, what was it doing to more vulnerable people like those living on small islands? That was a turning point for me." At that point Jolan was finishing school in Victoria and had been on track to study architecture at UBC. Instead, he took an internship at ForestEthics to work on the issue of increased tar sands pipelines and tankers coming to B.C. "My parents were confused that I'd taken this minimum wage job after getting good grades. Explaining my choice and the issues were frequent dinner table conversations, and I now realize this was good for developing my skills in how to talk to people who aren't starting at the same place as me." Jolan admits to being thrown in the deep end. All three interviewees for this piece point out that there's no training school in Canada for organizers, so unless the group provides training (like ACORN), you end up figuring a lot of organizing basics out for yourself. To fix this gap, Jolan and other organizers across groups have now begun to network, to develop a community of practice so that they can learn from one another and mentor new people. His first tasks were things like tabling at farmers markets, collecting petition signatures and staging rallies. It was when he was asked to organize a demonstration of two thousand people, though, that his understanding of organizing took a big leap forward. He realized there was no way he could do it all himself, so took time to write up 10 job descriptions for pieces of the overall event and then had one-on-one conversations to recruit people for those jobs, approaching people who had shown promise in his interactions to date. "What was amazing was that these people were actually thankful for the opportunity and excited," he says, "They ended up way exceeding what was asked of them. My job became supporting them rather than having much to do myself directly. This was a big shift in thinking for me." The demonstration itself met its goals and more, contributing to the campaign to stalemate the Harper government's big push for the Enbridge pipeline. The essence of organizing has started to come into focus for Jolan: "It's about creating pathways so that people who want to contribute can have the most impact. It's about challenging people to step up in different ways that are best suited to them. It's about helping the right people get into the right places and helping them realize their potential. The building blocks for organizing are one-on-one relationships." 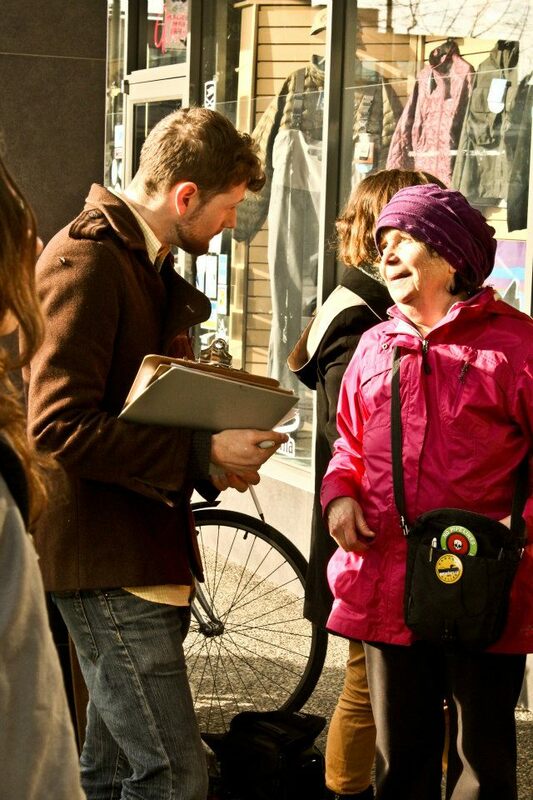 About a year ago, Jolan joined Leadnow.ca, an advocacy group working towards progressive democratic change in Canada. Jolan's job is to help leverage the group's impressive online presence (300,000 and growing) into offline action. This is one of the core challenges for many social change groups today -- how to go beyond the 'shallow' mass engagement the Internet can give you to actually move votes in the right places so that politicians will be responsive. To do that, you need to organize, and LeadNow.ca is doing this by creating neighbourhood teams from its online supporters and from people who may have done one offline action with the group in the past. "We're doing this at an interesting time because unlike the U.S., Canada doesn't have an established tradition of organizing. There's no expectation that organizers should follow any particular organizing model," he says. "So we're inventing things, particularly when it comes to 3rd party electoral work in the Canadian context, stuff that's never been done before. It's really exciting." Celine Trojand learned about politics from the bucket of a tractor. Growing up in Alberta near the B.C. border, her single mom was running a family and a large farm and had to recruit help from the community. "We had Mennonites and draft dodgers and neighbours all over to help, talking about how they think change happens," she says. "As a kid, I was sitting in the bucket listening to stories about how the world works, soaking it up." Celine is now an organizer with the Dogwood Initiative, a Victoria-based group that works to give people control over decisions affecting their land and water. Dogwood was one of the first adopters of the new organizing model in Canada, and as a result is considered to be one of the most sophisticated, also applying the latest database technology to its work. Dogwood has led the charge against tankers and pipelines on the B.C. coast, building opposition through tens of thousands of conversations, through leaving the office and talking to people at scale. In 2008 when Dogwood posted a position for an Outreach Coordinator, Celine was working at Lululemon after teaching in Japan. She got the job but wasn't comfortable with the title. "I had a hard time calling myself an 'environmentalist' or an 'activist,' so I settled on calling myself an 'organizer.'" She was still learning, though. "I didn't understand the depth of the meaning of organizing until I started reading Marshall Ganz and putting names to the things I was intuitively doing as well as discovering new things," she says. How does she define organizing now? "I think organizing is people building the infrastructure, skills and courage to face the challenges of our times, together. It's the unsexy, day to day stuff that actually changes the world and generates real power." Dogwood is now making bigger investments in its supporters, in cultivating leadership. This takes the form of a lot of training, both one-on-one and in group sessions. Celine says: "During power mapping, we sometimes see the world shift for our organizers when they see that often people we think are interested in change, like politicians, actually depend on maintaining the status quo. After all, successfully working the current system is how they got there." These investments in people are starting to pay off. "I had this 'Eureka!' moment recently when realized there were about six other Dogwood organizers who were trained and doing what I do every day. I have trained myself out of a job and that's really rewarding! I realized this really could work because we are scaling." A personality trait you find among many organizers is knowing you don't have all the answers, and making a virtue out of this -- an openness to trying new things, to learning from failure, and in getting better. As Celine says, "We're in this funny space right now where organizing is trending and more people want a piece of it. We're blasting it open and letting people in, but it's a bit chaotic right now as we reach critical mass." 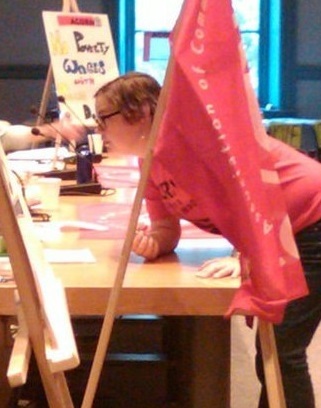 Like Jolan, Celine feels that Canadian organizing is still coming of age. "We've modeled a lot of what we do on what's happening in the U.S. but Canada is really a different ballgame. We need to let form follow function a little more, building our Canadian models around what works here. I think the end result will really surprise us." Jill, Jolan and Celine each work at groups that are growing and that are increasingly setting the agenda. Through the often invisible work of building relationships one person at a time they are helping people build power to get things done. Much of this approach isn't new, other than how it can now be much enhanced through technology, but it's an approach that the majority of Canadian progressive NGOs, unions and political parties are yet to seriously adopt. This is why they can still be called Canada's new organizers, and why they are blazing a trail for others to follow.